The new chip, which is based on the same Cell processor that can be found in the PlayStation 3, is currently on display powering several Qosmio notebook PCs on Toshiba’s vast stand at the show. In each case, the 1.5GHz chip is being used as an augment to the normal laptop CPU to enable the machine to perform computation-intensive tasks it can normally only dream of. Most obviously appealing is an image-manipulation application using Toshiba’s Facemation software to alter captured video on the fly. Unsuspecting geeks at the demo suddenly found themselves given an on-screen beehive hairdo, full makeup or realistic facial tattoos. The ultimate outlet of such processing power will be in department stores at cosmetics counters and in other areas where it’s desirable to see quick, hassle-free image changes. 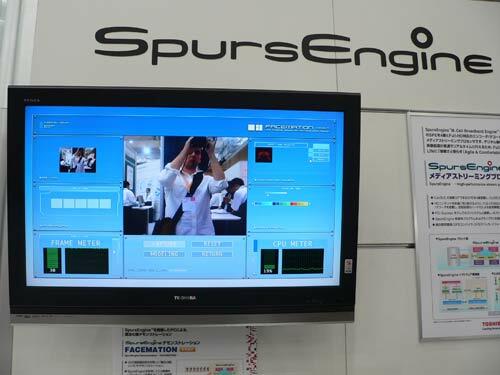 Other demonstrations of the might of the SpursEngine included a video-enhancement method that Toshiba called ‘Super Resolution’ for upscaling standard video to HD TV and real-time acoustic capturing using an array of eight microphones.